OCTOBER: Sunday, October 14th 2:00 – 6:00 Lutheran Hymn Festival in Church followed by a traditional Oktoberfest in the Gym. This event will be co-sponsored with the Springs Chapter of the AGO and will be their event for the month of October. We are advertising to all Lutheran churches in the area and hope to have a good turnout. We are counting on lots of good German dished prepared by our ladies again this year with addi- tional ones brought by members. This is going to be a wonderful afternoon and evening! The 4th Infantry Division Band and Jim Calm on the largest theatre pipe organ in Colorado. We are so fortunate to have them for three years in a row! New director, new band members, but the same wonderful, rousing, patriotic music. Free admission. Don’t miss this one! Click on the image and go directly to the organ's YouTube channel! Click on the YouTube icon and it will take you directly to the channel. You can view past performances and enjoy them over and over again! Subscribe to the channel and you’ll be notified immediately when new postings are available for viewing! See the History of the Pipe Organ Directly Below! The organ was built by Joel Kremer (1923 – 2000). Joel was born and raised in Denver. Joel’s mother was a classically trained pianist and his father was a “jack-of-all-trades” mechanic who operated several businesses related to appliance and automobile repair. Joel was blessed with musical talent from his mother and mechanical aptitude from his father. He would use both to great advantage choosing the theatre pipe organ as his hobby! His parents arranged for Joel to take organ lessons from the organist at their church, Augustana Lutheran. While a student at Denver East High School, Joel’s father took him to visit a friend at KLZ radio studio in Denver and Joel was allowed to play the station’s 2/6 Kilgen theatre pipe organ that was used for radio broadcasting. It was his first time playing a theatre pipe organ and it is fair to say that it made a lasting impression! After high school, Joel attended Colorado University to study pipe organ and business, but after only one year, World War II interrupted his college experience. Joel joined the Army Air Corps and served in Denver and Germany. Returning to Denver after the war, he worked with the Fred Meunier Pipe Organ Company, building, installing, tuning and restoring church organs and maintaining theatre pipe organs in the region. He also found time to serve as “house organist” at the console of the Denver Paramount Wurlitzer which was still being played before movies. Eventually, Joel joined his father in business and together they built A&I Bolt & Nut Company into a major supplier of fasteners of all kinds. As theatre organs fell silent, Joel began acquiring theatre pipe organ parts. In the early ‘50s he built his first instrument in the basement of his home on Ivanhoe Street. It was mostly a 2/4 Robert Morton he obtained from the Denver Alpine Theatre (these chests and percussions are still in the organ today.) But the organ continued to grow with parts from the Wurlitzer removed from the Colorado Springs Trail Theatre and other venues. Soon a larger space was needed to accommodate the expanding instrument. The family and the pipe organ would move to a larger house constructed with organ chambers on the main level. But the organ growth didn’t stop there. Another move was planned and the new house was in Ponderosa Hills in Douglas County. Joel didn’t stay very long at this location and soon moved again, this time to Castle Rock. 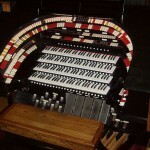 A four manual console was obtained to control the organ that was now up to twenty-two ranks. While in Castle Rock, Joel installed his first “computer relay” system, which he would learn to hate! It seems that whenever lightning would strike in the area, the memory of the relay would be lost. He was living in Castle Rock when Dave Weesner met Joel in 1973. In about 1978, a new house was built next door (next to the organ wing) and complaints from the neighbor began! So in 1980, Joel built a new house in the middle of a 5 acre site east of Parker and expanded the organ to a 4/28. He installed a new computer relay system which didn’t lose all memory during lightning storms! In the late 1990’s another move was to a specially designed ‘Organ Barn’ on property south of Kiowa, CO. The console was rebuilt with a new expanded stop rail to accommodate eight additional ranks of pipes, making the organ a total of 36 ranks. An upgraded computer relay system was installed. Sadly, during this installation, Joel was diagnosed with cancer which he gallantly fought the rest of his life. Joel played his only concert on the enlarged theatre pipe organ in the new “Organ Barn” on May 27, 2000. He died later that year. After Joel’s death, Dave Weesner assumed “caretaking” duties on the organ while Joel’s wife and family moved back east. No buyer was found for the property who wanted to purchase the pipe organ! David and Karen Weesner purchased the organ in the spring of 2001 and arranged to keep it at the barn for several years. Many picnic concert events were enjoyed at Joel’s Organ Barn until summer of 2011. Dave and Karen had been looking for a new home for the instrument in a more accessible location where it could enjoyed by many. The folks here at Immanuel Lutheran agreed in early 2011 to provide this new home for the organ. This would be its 7th installation! With the help of many eager volunteers, the massive instrument was dismantled once again and moved to the gym in Sept/Oct 2011. Over the next 12 months it was reassembled here in its new configuration. It will be used for various church events, but will also be available for parties, receptions and concerts like this one. Although there were a few dozen wonderful folks who helped with the breakdown, packing, loading and unloading of the instrument, there were four who became the real “Organ Crew” and worked with Dave nearly seven days a week to reassemble this mighty theatre pipe organ. Dave and Karen are especially grateful to Drexel Biddle, Stan Destefan, Dan Houfek and Keith Roberts who gave literally thousands of hours to this project. These are amazing people and the project would not have been accomplished without their dedication! The organ first played (from the console) in the gymnasium on Saturday, September 22, 2012, just over 11 months from the day the last load of parts arrived in the gym! Long time friends Ed and Patti (Simon) Zollman came from Wichita to provide initial tuning and setting of tremulants and by September 28th it sounded like a real theatre pipe organ!!! Somewhere over 5000 manhours was invested and with no serious injuries! There were many band-aids required! If done by a professional pipe organ firm, the job would have cost in excess of $200,000. Lower Level; Tibia, Concert Flute, Flute Celeste, Viol D’Orchestra, VDO-Celeste, Diapason, Clarinet, String II, Vox Humana, Tuba. Upper Level; Trompette, Gemshorn, Gemshorn Celeste, Salicional, Salicional Celeste, Fife I & II, Chrysoglott. Lower Level; Oboe Horn, Un-Nicked Flute, Saxophone, Gamba, Gamba Celeste, Tibia, String I, Vox Humana, English Horn, Kinura, French Horn. Upper Level; Horn Diapason, Post Horn, Tromba, Trumpet, Orchestral Oboe, Viola, and Viola Celeste.